If you run a non-profit convention, getting the word out to fans in your area isn't always the easiest thing to do. Although getting listed on FanCons.ca certainly helps, but sometimes you just need to take it a step further. That's why we're offering ad swaps. The more you help advertise FanCons.ca, the more we'll advertise you! Run a banner for on prominent pages on your convention's web site for the month before your convention (or more) and earn one month of banner advertising on the site. Our banner ad should be be displayed every time the page is loaded and not be rotating with other images. Agree to print a ad in your convention's program guide and earn one month of banner advertising on . If your program guide is 7"x8.5" or larger, the ad must be at least 1/4 page. If your program guide is smaller than 7"x8.5", the ad must be at least 1/2 page. We can supply color or B&W ads. As part of the ad swap, you will get an account on our DoubleClick advertising server which you can use to monitor your ad's impressions and click-throughs. Ad swaps are only for conventions listed on the FanCons.ca site and must therefore qualify under our Policy on Listed Events. Ad swaps are only available for non-profit or college-based anime conventions. While for-profit conventions may be listed on the FanCons.ca site, they do not qualify for ad swaps. Conventions that qualify may only use their ad swap for an ad for that convention and cannot run ads for other conventions or businesses. The convention's name must appear somewhere in its banner ad. An event running FanCons.ca advertising prior to being approved for an ad swap in no way obligates FanCons.ca to commit to an ad swap with the event. 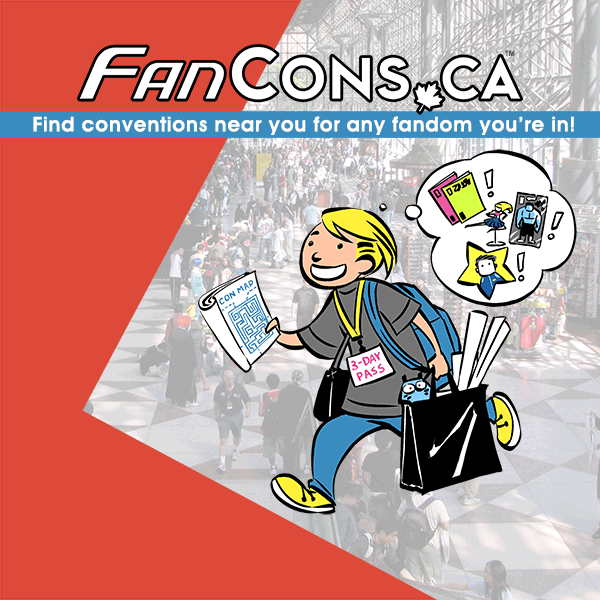 Running a FanCons.ca banner ad on the convention's site for more than one month will not earn the convention more than one month of display time on the FanCons.ca site. All FanCons.ca advertising must be provided by FanCons.ca and may not be resized, edited, or modified in any way. The convention may provide leaderboard size ads only. (970x90, 728x90, 468x60, and 320x50 sizes) We will not serve block ads through our ad swap program. If you submit multiple ad creatives, they will run alternating in the same ad slot and the overall frequency of your ads will not increase. All ad swap ads are run at the same priority. Ad swap priority is lower than that of paid advertisers, but higher than that of house and remnant advertising. Failure of an event to run FanCons.ca advertising will result the removal of that event's ads from the FanCons.ca site and may eliminate the possibility of any future ad swaps. All other advertising policies still apply. In the event the convention is cancelled, the convention's ads will be removed and the convention will be considered free of all reciprocal advertising obligations. In the event the convention is postponed, the convention's ads will be put on hold until such time that a new date is announced. Advertising may be refused to any convention for any reason, including inavailablity of advertising impressions on the FanCons.ca site to offer for swap. All above references to FanCons.ca include FanCons.com, FanCons.ca, and FanCons.co.uk. Contact us to arrange for an ad swap with your convention. Please mention if you are interested in an ad swap when you contact us.